Keywords: Anencephaly, cyclopia, holoprosencephaly, spinal rachischisis. Cyclopia is a rare anomaly resulting from an anomalous development of midline mesodermal structures. In cyclopia there is a gross deformity of the orbital region, resulting in the formation of a central cavity called the pseudo-orbit, absent nasal cavity and its replacement by a rudimentary proboscis which is situated above the pseudo-orbit. Incidence of cyclopia is around 1.05 in 1,00,000 births, including stillbirths. Neural tube defects are categorised under birth defects of the brain, spine, or spinal cord. They occur in the first trimester of pregnancy. The two most common neural tube defects are spina bifida and anencephaly. Anencephaly occurs as a result of failure of neurulation with an incidence of almost 1:1000-1:20000. A rare and most severe form of neural tube defects is craniospinalrachischisis which is characterized by anencephaly associated with a bony defect of the spine and exposure of neural tissue. This lesion lacks skin over the spinal cord. An extensive review of literature search revealed 9 such reported cases in which anencephaly with spinal rachischisis was accompanied by cyclopia, proboscis, microphthalmia, a single nostril and other features of holoprosencephaly. We report a case of a similar rare combination of true cyclopia with craniospinal rachischisis. A 30 year old female with 5 months of amenorrhoea came to our hospital for an antenatal check-up. She had not visited our hospital earlier and this was her first antenatal check-up. She was 3rd gravida with two previous normal deliveries and both the children (elder female child 3 yrs old and younger male child 1 and half year old) are healthy and living. Hers was a third degree consanguineous marriage. She was immunized with 2 doses of T.T. and was taking regular iron and calcium tablets, but no folic acid supplementation. There was no history of hypertension, diabetes mellitus, renal disease or any other major illness. There was no history of any alcohol consumption. TORCH screening for antenatal infections had not been carried out. On examination she appeared moderately nourished. She had not undergone any first trimester ultrasound scan. Fetal ultrasonography in current antenatal check-up demonstrated a single live foetus of 19 weeks and 6 days gestational age. The calvarium was absent and there appeared to be no parenchymal tissue above the orbit. In the coronal plane a frog like appearance of the foetus was noted denoting a diagnosis of anencephaly. No other abnormality with respect to other organs was identified. Craniospinal rachischisis was not picked up on ultrasonography. The family was informed regarding the non-viability of this developmental disorder and counseled for termination of pregnancy. Dilation and curettage was performed and termination of pregnancy was performed following written informed consent of both the parents. The foetus was sent for post-mortem examination. A female foetus weighing 160 gm with attached umbilical cord measuring 3.5 cm in length was received for examination. On external examination, single aperture for the eye measuring 10 × 10 mm was noted in the midline of the face which showed presence of two fused eye globes, and two separate pupils each measuring 2 × 2 mm. The nose was absent and was replaced by a proboscis above the median eye measuring 10 mm in length and 5 mm in diameter (Cyclopia). No cleft lip or cleft palate was noted. The cranial vault was absent and the brain was replaced by a protruding blackish vascular soft tissue mass (Anencephaly). Also noted a spinal cord defect (spinal rachischisis) limited to the cervical region. This area was devoid of overlying skin, and the cervical segment of the spinal cord was directly exposed to the exterior as the vertebral arches were deficient. Skull base was present but rest of the vertebral column below the level of rachischisis appeared normal. Scoliosis or retroflection of the spinal cord was absent. All four limbs were well developed with normal number of digits. No skeletal anomalies such as club feet were noted [Figure 1]. Microscopic examination of the proboscis revealed, tissue lined by stratified squamous epithelium along with chondroid tissue, focal areas of calcification, cartilage and rudimentary neuro-epithelium [Figure 2]. 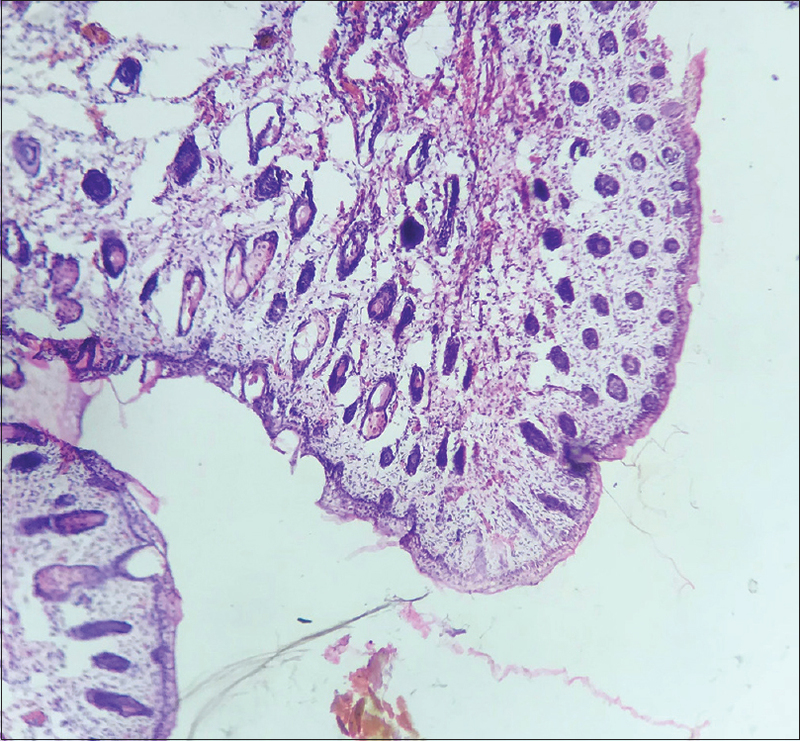 Respiratory lining epithelium was not seen in the sections taken from the proboscis. No gross or microscopic anomalies were noted in thymus, heart, lungs, liver, spleen and bilateral kidneys examined. The adrenals could not be identified, probably indicating absence/marked hypoplasia. Sections studied from the protruding angiomatous mass and the cervical rachischisis segment revealed fairly well developed cord tissue with grey horns surrounding a central canal which contained clusters of large neurons with prominent nucleus and nucleolus. The exiting nerve roots were enveloped by a heavily vascularised leptomeninges with fetal blood vessels [Figure 3]. Based on the above findings a diagnosis of cyclopia with craniospinal rachischisis was rendered. The prechordal mesoderm during embryogenesis forms the median facial bones and also induces rostral neuroectodermal differentiation. Defect in prechordal mesodermal development leads to the malformation of the facial bones and organogenetic cleavage of the prosencephalon. Three types of eye deformities have been seen in cyclopia: one eye (monophthalmia), two fused eyeballs (synophthalmia) or complete absence of eyeballs (anophthalmia). The foetus in this case report had synophthalmia. Environmental factors implicated in the development of cyclopia include maternal diabetes mellitus, maternal alcoholism, in utero infections with cytomegalovirus, rubella or toxoplasma and teratogenic drugs such as retinoic acid, cholesterol synthesis inhibitors as well as association of genetic factors such as chromosomal mutation, sonic hedgehog gene mutation or a part of syndrome. The specific genes which cause the neural tube defects have not yet been identified. The methylene tetrahydrofolate reductase gene has been shown associated with development of neural tube defects. Association of cyclopia with parental consanguinity has also been observed in various case reports. In the index case history of consanguineous marriage and failure to take folic acid supplementation was present, however there was no significant history of past maternal diabetes, alcoholism or infections. Anencephaly is assumed to result due to failure of closure of the anterior (cephalic) end of the neural tube at 24-26 days after fertilization resulting in absence of the major portion of brain, skull and scalp. It results from the defective formation of neural tissue from the ectoderm (neurulation). The neural tissue is exposed and the cerebral hemispheres are absent. The neural tissue is rudimentary and enveloped by heavily vascularized mesenchymal tissue with large congested thin walled venous channels that may rupture to produce hemorrhage. The incidence of association of anencephaly with spinal rachischisis varies from 17-50%. It results from failure of closure of the anterior neural tube along with partial or complete exposure of the body of the neural tube. Depending on the site of involvement, the defect may be localised to the cervical region or may involve the whole length of the neural tube. Vertebral defects, pulmonary hypoplasia and club feet are more common in anencephaly with spinal rachischisis as compared to anencephaly alone. Vertebral defects include scoliosis and retroflexion of the spine. The association of anencephaly and spinal rachischisis is called cranio-spinal rachischisis. In the present case craniospinal rachischisis was limited to the cervical region and was not associated with any other spinal cord deformities. Associated lung hypoplasia was not identified. In the largest series of 136 cases of anencephaly with spinal rachischisis, reported renal defects in 17%, cleft lip and/or palate in 10%, gastrointestinal defects in 9%, omphalocele in 5%, diaphragm abnormalities in 4% and spleen abnormalities in 2% of cases. However, none of these above were identified in our case. A PubMed search for craniospinalrachischisis with cyclopia revealed single case series study of 9 cases by Lemrie et al. In their study they reported several coexistent visceral anomalies associated with neural tube defects. A large number of cases showed adrenal hypoplasia due to the lack of hypothalamus development. In the present case, the adrenals could not be identified which could reflect complete absence of adrenals. Chromosomal abnormalities such as trisomy-D, monosomy-G mosaicism, translocation affecting chromosome 3 and group C chromosome, and chromosome 10 short arm deletions have also been recorded in cyclopia. Karyotyping in our case could not be performed due to unavailability of fresh fetal blood sample or umbilical cord sample. Cyclopia results from arrest of development of anterior end of the neural plate, hence it is always associated with abnormalities of the brain. In the present case, cyclopia was associated with neural tube defect anomalies such as craniospinalrachischisis. This co-occurrence suggests probable arrest in prosencephalon development with involvement of precordal mesoderm leading to holoprocencephalic facial features which is uncommon finding in anencephaly. In the present case cyclopia and spinal rachichisis were missed on ultrasound examination. Only few cases of association of Cyclopia with craniospinal rachischisis have been described in literature. The possible association between anencephaly and spinal rachischisis is unclear and also recurrence of these congenital anomalies in subsequent pregnancies is not known. In present case two identifiable risk factors - a history of consanguineous marriage and lack of folic acid supplementation were present. Hence we conclude that appropriate counseling in the antenatal period would help to prevent occurrence of neural tube defects and also awareness of spectrum of ultrasonographic findings of cyclopia can improve the accuracy of early prenatal diagnosis of cyclopia and will help in counseling the parents for termination of pregnancy. Yilmaz F, Uzunlar KA, Kilinç N, Bayhan G, Gürkan F, Yayla M. A case of cyclopia. Perinatoloji Derg 1998;6:3-4. Rathod S, Samal SK, Begum J. Holoprosencephaly with cyclopia: A rare case report. Int J Otorhinolaryngol Head Neck Surg 2015;1:37-9. Boukerma V, Corre P, Perrin JP, Khonsari RH, Mercier J, Salagnac JM. Spina bifida and craniocervical junction anomaly – A case report. J Dentofacial Anom Orthod 2008;11:60-7. Jaganmohan D, Subramaniam P, Krishnan N, Mahajan P. Two cases of craniospinal rachischisis totalis: Role of magnetic resonance imaging in diagnosis and review of neural tube defects in the Indian context with implications for folate fortification. J Pediatr Neurosci 2017;12:32-5. Adams LR, Larroche JC, Vries L. Malformations of central nervous system. In: Barness EG, editors. Potter's Pathology of Foetus, Infant and Child. 2nd ed. China: Mosby: Elsevier; 2007. p. 1959-2026. Goyal M, Kapoor S. True cyclopia. J Clin Neonatol 2015;4:64-5. Lemire RJ, Cohen MM Jr., Beckwith JB, Kokich VG, Siebert JR. The facial features of holoprosencephaly in anencephalic human specimens. I. Historical review and associated malformations. Teratology 1981;23:297-303. Salama GS, Kaabneh MA, Al-Raqad MK, Al-Abdallah IM, Shakkoury AG, Halaseh RA, et al. Cyclopia: A rare condition with unusual presentation – A case report. Clin Med Insights Pediatr 2015;9:19-23.